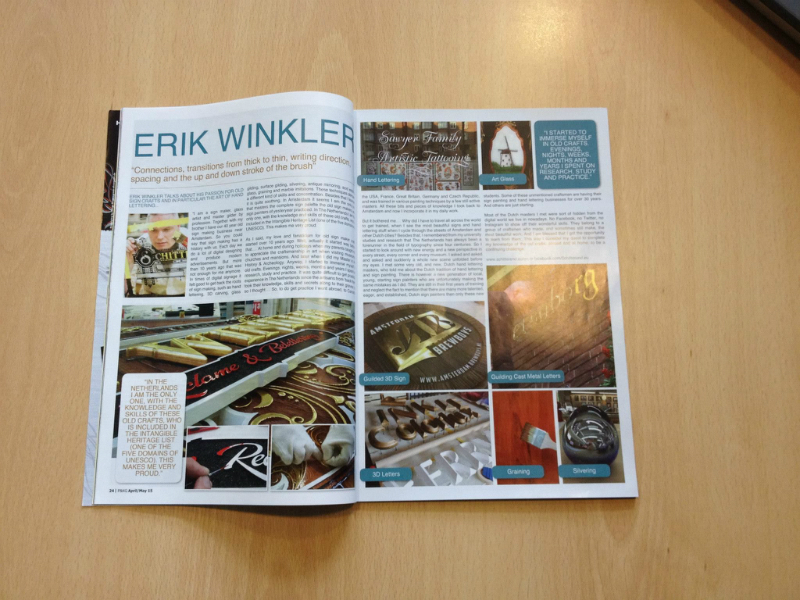 Onlangs is er in het Kustom Magazine een artikel over Erik Winkler (Schitterend) gepubliceerd. Editie april-mei 2015 op bladzijde 24 en 24. Hierbij is de tekst van het artikel (Engels) te lezen. Erik Winkler talks about his passion for old sign crafts and in particular the art of hand lettering. “I am a sign maker, glass artist and master gilder by profession. Together with my brother I have our 40 year old sign making business near Amsterdam. So you could say that sign making has a history with us. 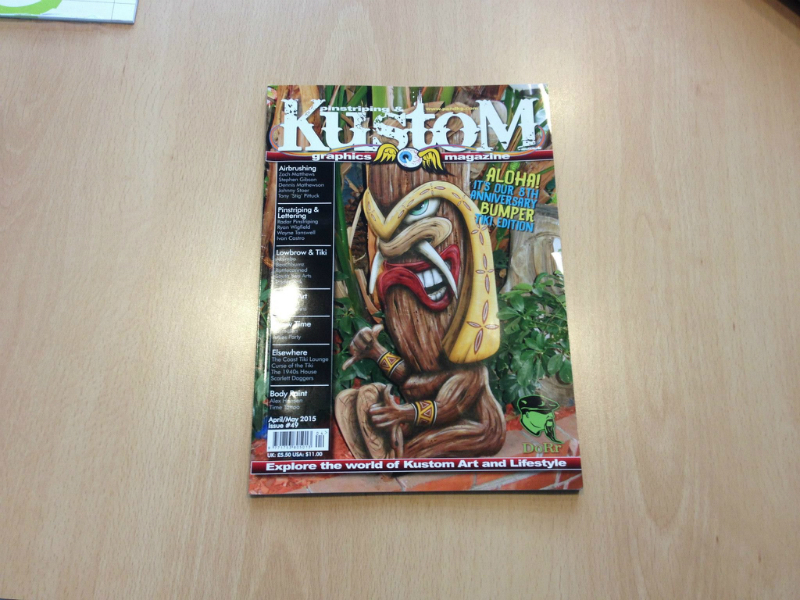 Each day we do a lot of digital designing and produce modern advertisements. But more than 10 years ago that was not enough for me anymore. In times of digital signage it felt good to get back the roots of sign making, such as hand lettering, 3D carving, glass gilding, surface gilding, silvering, antique mirroring, acid etching glass, graining and marble imitations. These techniques demand a different kind of skills and concentration. Besides that I learned it is quite soothing. In Amsterdam it seems I am the only one that masters the complete sign palette the old sign makers and sign painters of yesteryear practiced. In The Netherlands I am the only one, with the knowledge and skills of these old crafts, who is included in the Intangible Heritage List (one of the five domains of UNESCO). This makes me very proud. As I said, my love and fanaticism for old sign maker crafts started over 10 years ago. Well, actually it started way before that…. At home and during holidays when my parents taught me to appreciate the craftsmanship in art when visiting museums, churches and mansions. And later when I did my Master in Art History & Archeology. Anyway, I started to immerse myself in old crafts. Evenings, nights, weeks, months and years I spent on research, study and practice. It was quite difficult to get practical experience in The Netherlands since the artisans from ‘back then’ took their knowledge, skills and secrets along to their graves; or so I thought…. So, to do get practice I went abroad, to Canada, the USA, France, Great Britain, Germany and Czech Republic, and was trained in various painting techniques by a few still active masters. All these bits and pieces of knowledge I took back to Amsterdam and now I incorporate it in my daily work. But it bothered me…. Why did I have to travel all across the world to get trained, when I see the most beautiful signs and hand lettering stuff when I cycle through the streets of Amsterdam and other Dutch cities? Besides that, I remembered from my university studies and research that The Netherlands has always been a forerunner in the field of typography since four centuries. So I started to look around with new energy and a new perspective in every street, every corner and every museum. I asked and asked and asked and suddenly a whole new scene unfolded before my eyes. I met some very old, and new, Dutch hand lettering masters, who told me about the Dutch tradition of hand lettering and sign painting. There is however a new generation of local, young, starting sign painters who are unfortunately making the same mistakes as I did. They are still in their first years of training and neglect the fact to mention that there are many more talented, eager, and established, Dutch sign painters then only these new students. Some of these unmentioned craftsmen are having their sign painting and hand lettering businesses for over 30 years. And others are just starting.